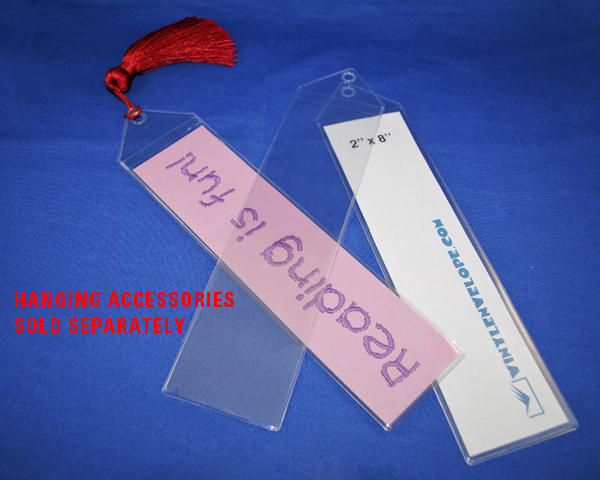 Clear plastic vinyl photo strip protector and bookmark sleeve with a reinforced triangle header and a hang hole. Decorate the hang hole with tassels and ribbons. Use this high-quality 8-gauge clear flexible vinyl instant photo strip sleeve with 2x8 photo booth strips and photo booth bookmark strips. Party photo booths are a fun, inexpensive and memorable activity and become a great party favor for all type of events such as weddings, receptions, corporate events, employee appreciation, Bar Mitzvah, Bat Mitzvah, fundraisers, trade shows, holiday parties,marketing events, social gatherings, High school proms & other dances, college functions, school parties, birthday parties, family reunions and more! If you are in the photo booth entertainment business, then offer these photo booth strip bookmark sleeve and photo protectors to your customers. Don't settle for inferior products from thinner material that have only one layer of material to support the hole. We use heavy 8-gauge material and reinforce the header and hole with two layers of material. Use the hole to hang your bookmarks or 2" x 8" photo strips or to attach a tassel or ribbon (not included) for decoration. Turn the photo strip from your events in to lasting memories and protect them at the same time. Pocket dimensions: 2 1/4" x 8 1/4"
Maximum insert size: 2" x 8"
Besides protecting 2x8 photo booth strips, you can also insert your own custom decorated bookmarks. Also, perfect to use as a 2 x 6 photo booth strip picture holder. Kiwi paper makes great bookmark holder book mark sleeve inserts. Call for prices on larger quantities, special sizes or custom imprinting. Note: Tassels are for illustration and are NOT included.